Our designer ceramic puppy bowls are not only handmade to order but they can also be personalised with your puppy's name and they are made exclusively for Chelsea Dogs. We have a range of patterns and colours for you to choose from so you can either order a complete matching set or you can mix and match the colours and patterns however you like! Our range of designer puppy bowls are all handmade here in the UK by some very talented potters. One of our collections can be painted with any breed of dog and personalised with your puppy’s name. You can even email us a photograph of your dog for us to use to really capture the nature of your dog on the bowl. 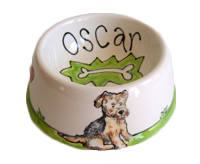 Our other range of designer dog bowls are handmade to order exclusively for us and they can also be personalised with your puppy’s name. Both are suitable for food and water and are dishwasher safe for easy cleaning.